As a parent who has had two children in the child care system, I know that now is the time of year you start to plan child care options for the full year to come. With so many things to consider, it’s easy to get a little lost. What kind of child care should I choose? Will I get a place close to home or close to work? Even if you already have a child in care, planning for the year ahead can bring more new challenges as your circumstances change. The percentage of subsidy you’ll be entitled to will be based on your combined annual income, with more financial support available if your family is on a lower income. If your combined family income is less than $185,710^, we’re abolishing the cap on the amount of subsidy you can receive per child. 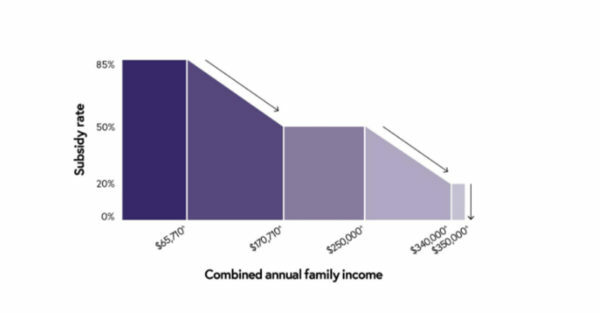 And if your family has a combined income of between $185,710^ and $350,000^, the cap has been increased to $10,000^ per child (the current rebate cap is $7,613). Other activities that don’t fall into these categories will be assessed on a case-by-case basis. The higher the amount of activity, the more hours of subsidised child care you may be able to access, up to 100 hours a fortnight, per child. This is good news for parents who are looking to return to work, accept an extra shift or take up a new activity, such as a training course. For example, if you work part-time and also study, both activities will be taken into account. The hours of activity you undertake do not need to coincide with your child care hours. So if you work on the weekend, you can still use those hours to calculate child care subsidy during the week. 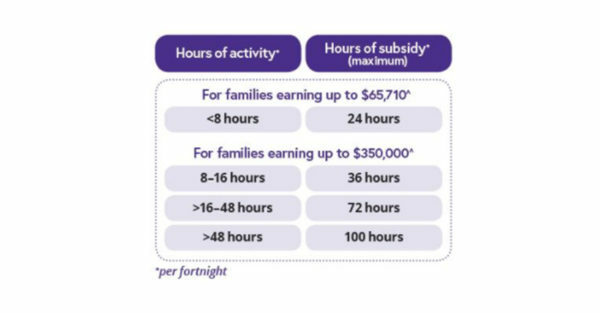 If your family earns $65,710^ or less a year, and you do not meet the activity test, you will still be able to access up to 24 hours of subsided care per child per fortnight. Centre based care – $11.55^ per hour. Family Day Care – $10.70^ per hour. Outside school hours care – $10.10^ per hour. Let’s take the hypothetical example of the Jones family to see how this breaks down. The Jones’s earn $65,000 per year and use a centre-based service, making them eligible for a subsidy of 85 per cent. If their childcare service charges $9.00 per hour, under the hourly rate cap for centre-based services of $11.55, they will be entitled to 85 per cent of the $9.00 which is $7.65. The family will then pay a gap fee of $1.35 per hour. However, if the Jones family’s childcare service charges $12.00 per hour, which is over the hourly rate cap of $11.55, they will receive 85 per cent of the hourly rate cap, which is $9.82. The family will therefore have a gap fee of $2.18 per hour. Although the changes don’t come into effect until 2 July next year, you can plan ahead using the estimator to find out how much subsidy you may receive. The estimator doesn’t record your details, so you can try different scenarios, such as working more or enrolling in part-time study, to see what’s right for your family. We’ll also make sure there’s plenty of information available for you in the lead up to the start of the new system and we’ll let you know about any other actions you need to take before 2 July 2018. ^ These figures will be increased by the Consumer Price Index (CPI) when the package begins in July 2018. Senator Simon Birmingham, Minister for Education and Training has served as a Liberal Party Senator for South Australia since May 2007 and in September 2015 was appointed as Minister for Education and Training. He has two young daughters and his family have been part of the child care system.